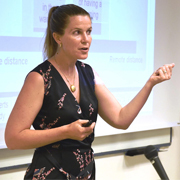 This month the Coller School of Management held a special course dealing with the lessons to be learned and insights to be derived from the Israeli innovation environment. The course was conducted within the framework of the cooperation that has been going on for more than six years between Tel Aviv University’s Coller School of Management and the Wharton School at the University of Pennsylvania. 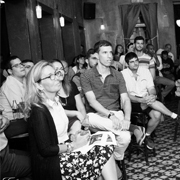 The course was part of the joint program of the two schools that focuses on various aspects of innovation and entrepreneurship, the Israeli entrepreneurial spirit, the influence of Israel’s history and culture on the behavior of young technology companies, research and development, and venture capital. It is a multidisciplinary course combining lectures, carrying out joint projects with Israeli industrial companies, visits to companies, and hosting guest lecturers who offer their experience and insights. The course is led jointly by Dr David Zvilichovsky of the Coller School and Prof. David Hsu of the Wharton School. Within the framework of the course, teams of students from both sides of the ocean worked with leading Israeli companies. Among the companies were Valens, which deals with communications infrastructure for vehicles of the future; Thetaray, which deals with machine learning; NSL Communication, which deals with satellite technologies; and Silverfort, which deals with advanced cyber security. The founders and managers of innovative enterprises that the course hosted shared a little of their experience with the students. Among these entrepreneurs we should mention the following. Daniel Schreiber is co-founder and CEO of Lemonade, which raised $120 million a few weeks ago and brings innovation to the conservative insurance industry by using insights from behavioral economics and advanced software systems. Dr Amir Konigsburg is founder and CEO of Twiggle, which provides advanced search engines for online commercial companies and enables them to compete with Amazon. Prof. David Mendelovic is a serial entrepreneur in the areas of communications and image processing, founder and CEO of Corephotonics. Jonathan Adiri is founder and CEO of Healthy.io, which integrates image processing technologies with smart phones in order to simplify medical tests. Eran Shir is founder and CEO of Nexar, which enables the use of smart phones to photograph vehicles for safety and vehicle-to-vehicle communication applications. Among the leading companies that students also visited were Argus, which deals with cyber security for vehicles and was recently listed among the 20 most promising companies in technologies for vehicles, and was sold about a month ago to Continental for €430 million. A team of students even had the privilege of experiencing a taste of the cyber age in a vehicle in which the attackers neutralized the braking system. A visit to the control section of Applied Materials in Rehovot exposed the students to one of the world’s leading producers of equipment for silicon circuits, which was among the first multinational companies to operate a full business unit in Israel. Leading venture capitalists that provide financing and guidance to the local high-tech industry also played a central role in the course. Among others, one of the speakers was Jonathan Medved, one of the pioneers of the venture capital industry in Israel and CEO of OurCrowd, a crowdfunding platform that enables private investors from all parts of the world to join in investing in startups. Another was Yahal Zilka, founding partner of the Magma Fund, which led investments in companies such as Argus and Waze. Then there was Gigi Levy, a graduate of Tel Aviv University’s Coller School of Management and one of the best connected super angels in Israel, who recently announced the raising of $150 million for the NFX Guild, and Dov Moran, the inventor of the disk-on-key, who today manages the Grove Ventures Fund. The advice of the serial entrepreneurs and investors fired the imagination and dreams of the students and provided all of us with much food for thought. The combination of theoretical analysis, international team work, analyzing topical issues and meeting leading entrepreneurs and executives provided the students with an in-depth view of the local industry and Israeli innovation, imparting insights and experiences that they will not forget in a hurry.